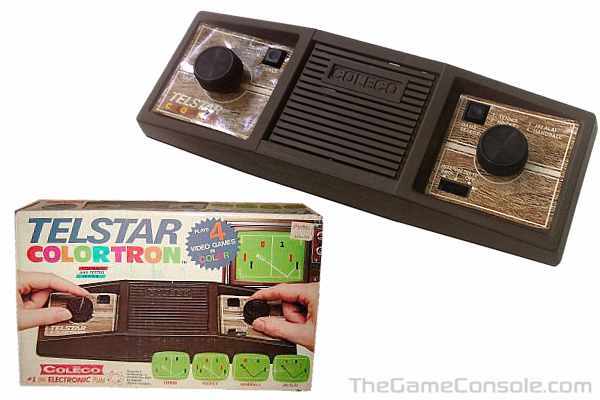 The Telstar Colortron was released in 1978. It is one of the only systems based around the AY-3-8510 game chip, a derivation of the AY-3-8500. The system offers 4 games instead of 6, but the picture is in color, which is much better. Sound is not unpleasant like on most of the other systems, since it comes from a little piezo beeper which produces a very discrete sound. The game selection is done using a push-button rather than a switch (easier to use and more robust). Curiously, the system requires two 9V batteries: one for the "video" (the games), and one for the "sound" (maybe the internal circuitry of the piezo beeper).